In Burgenland, Austria's easternmost region, the sun shines more than 300 days a year, making it ideal for grapes and cyclists. Cycling and wine have long captured the imaginations of American travelers with dreams of gliding through verdant, château-dotted valleys with a baguette and a bottle of Cabernet Franc. But cycling through wine country is no longer an activity reserved for the French (or Francophiles). Wine regions from Africa to Argentina are opening new cycling paths and offering programs for bike enthusiasts — a cleaner, healthier and more in-depth way to taste the terroir of a region. Tour operators have jumped on this faster than you can say santé, offering a litany of wine-centric cycling excursions around the world. 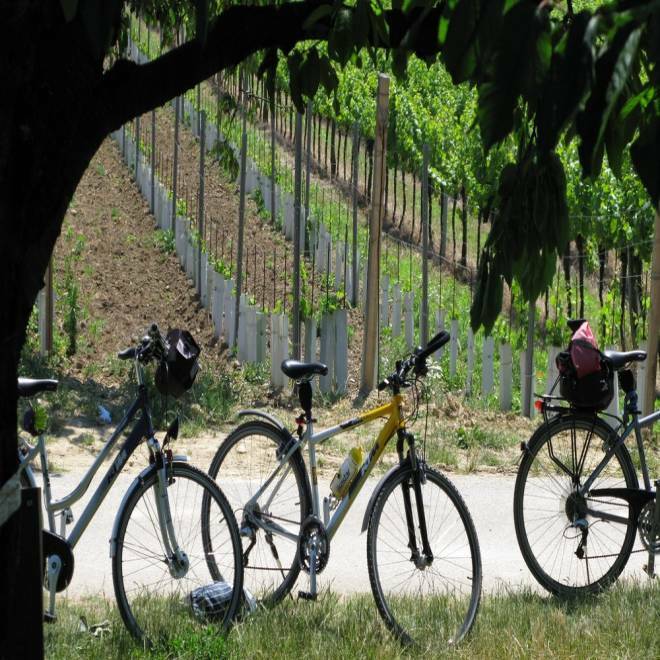 Existing bike-tour companies like Butterfield & Robinson have been hosting vineyard bike tours since 1966. Though new destinations are added annually, trips through tried-and-true wine regions like Bordeaux and Tuscany are popular. But new outfitters like DuVine Adventures — whose motto is “Bike. Eat. Drink. Sleep.” — are jumping into the game with more adventurous excursions to untapped areas like Alentejo, Portugal, and Slovenia’s Gorizia Hills on the Italian border, as well as more typical destinations like France’s Burgundy and Spain’s Rioja. In many cases, one doesn’t even need to leave the city to access vineyards and tasting rooms. Frankfurt; Vienna; Santa Barbara, Calif.; and Switzerland’s UNESCO-inscribed Lavaux have urban vineyards or offer wine regions that are easily reached from major metro areas and ideal for evening or half-day trips. And though drinking too much and cycling is not advised, biking through wine country is an easy way to add a few calorie- and carbon-neutral sips to your vacation.